As a lot of you already know, my house is more than 130 years old. It’s bathed in history of the midcoastal area, and it shows. Despite the changes that have been made to the inside to bring it to its beauty again, the past can still be seen in corners, above your head, along the edges. The only original pieces that are still left on the inside are the wide, pumpkin pine boards with square headed nails in the master bedroom, the carved tree “beams” that support the middle of the home and the “half-way” point downstairs, and the front door. Well, the front door until recently. With decades and decades of improper care and half-assed work, the home naturally deteriorated. This includes a lot of things circa-1880 that I wanted desperately to keep, but just couldn’t. I searched for replacements that had been salvaged from other old homes in the state, but found nothing. In the end, more was modernized than originally planned. But all is well that ends well. The front door was a beautifully carved, solid wood door with two oval and scalloped shaped glass panels. It still had it’s original door locks with the skeleton key. I loved the door. However, a good 30 or more layers of paint covered it, it was weathered, and was at some point in its life, trapped behind a storm door. While trapped behind that storm door, the sun was able to create hell-like conditions between the glass and the door. Inevitably, the wood started to pop and crack. The door damaged beyond repair. Salvaged from a construction job was a more modern wood door, but it suited the style and feel of the house just the same. Perfectly flat, well taken care of, it became mine. Red doors mean many things in many different religions and cultures. I chose it because it’s such a vibrant color, it suits my personality, and it reflected perfectly on what life is like here at the quarry. 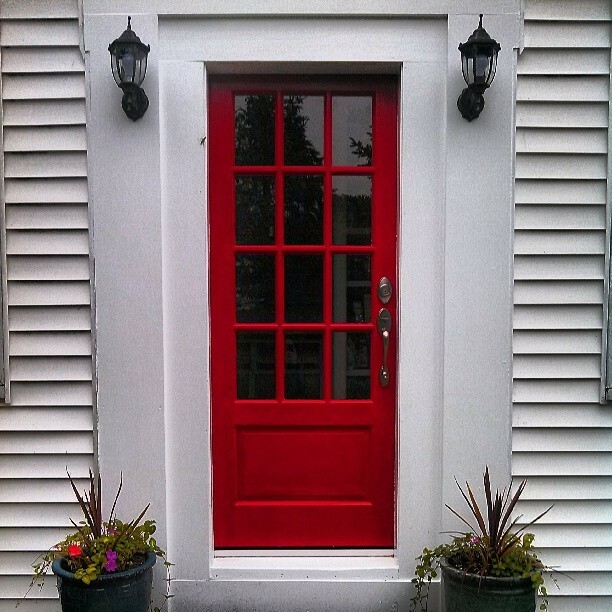 Once we finally got the work done and the door installed, I can’t count how many times I’ve stood there, staring at that beautiful red door. The feeling of excitement rolls through me every time I drive up my driveway and see it. It could be that my soul is happy that my home has once again been given something of beauty and craftsmanship that it is well deserving of.